The wireless industry is facing a capacity crunch. There is no perfect solution, but here are some actions carriers are taking to avoid a spectrum crisis. This is part four of a week-long series the cell phone capacity crunch. NEW YORK (CNNMoney) -- It's easy to get frustrated about the effects of the spectrum crunch. Higher bills, fewer choices, and dismal service are enough to make even the casual cell phone customer furious. Making things worse, none of the solutions for easing the spectrum shortage are inexpensive or easy. There's no catch-all fix on the horizon. The good news, though, is that options exist -- and carriers understand that doing nothing would be disastrous. Here are the four primary ways they're going about staving off a spectrum crisis and the resulting cell phone apocalypse. Reusing spectrum: One way to relieve capacity jams is "cell splitting," which involves either adding more cell sites or adding more radios to existing sites to increase the number of connections that a network can handle. The problem is that it's expensive and tricky. "It would seem to some people that you could infinitely reuse the spectrum you already have," says Dan Hays, a partner at PricewaterhouseCoopers' consultancy. "The reality is a bit more complicated." 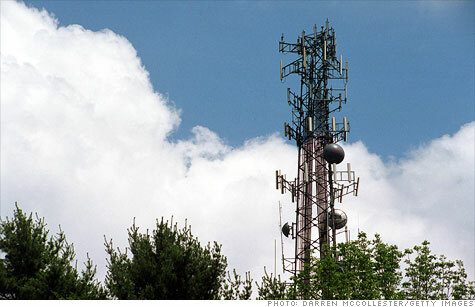 As the number of bandwidth-hogging smartphones and tablets increases, carriers have to deploy more and more towers. They face practical hurdles: no one wants a new antenna in their backyard. Interference is also a growing problem as more towers get added. There are, however, some innovative solutions being developed. Alcatel-Lucent (ALU) introduced lightRadio a year ago, taking all the components of an antenna and base station and cramming them into a cube that fits in your palm. The company is working with carriers to deploy the devices throughout capacity-constrained metro regions, placing them in spots like on top of telephone poles and on the sides of buildings. Make more efficient use of existing spectrum: If you imagine wireless spectrum as a highway, that road is getting jammed with trucks carrying big loads of YouTube and Netflix (NFLX). New network technologies can get those trucks to drive much closer together, freeing up capacity. Verizon (VZ, Fortune 500), AT&T (T, Fortune 500) and Sprint (S, Fortune 500) are deploying a "4G" technology called Long Term Evolution, which adds about six to eight times more capacity than a traditional 2G network. The problem is that the vast majority of cellular customers don't have 4G-capable devices. Even Apple's (AAPL, Fortune 500) iPhone isn't there yet. LTE has nowhere near the same level of national coverage as less-efficient 2G and 3G services. Even if carriers offered incentives to get customers to buy 4G phones, they would still need their 2G and 3G networks to keep users connected in non-4G areas. Down the road, some analysts predict that even 4G's extra capacity won't be enough. "You can try to be more efficient, but we're really nearing the end of that," says Ken Rehbehn, an analyst with Yankee Group. "It's reaching the point of diminishing returns as we push up against the boundaries of physics." Get people off the cell network: Another solution is to simply get customers to stop using so much spectrum. It's easier to cram a lot more data into wires than into airwaves -- that's why your home broadband is generally much faster than your smartphone. Offloading mobile traffic to Wi-Fi connections is an efficient way to lighten the load. Carriers are using carrots and sticks to shift traffic. The sticks: tiered pricing models and speed limits for the biggest bandwidth hogs. The carrots: free Wi-Fi in crowded areas. AT&T has hotspots in packed places like New York City's Times Square and programs many of its phones to connect to them automatically. The tactic is working. About 22% of traffic from mobile devices will travel over non-carrier networks in 2016, according to estimates from Cisco (CSCO, Fortune 500). That's double today's rate. Add spectrum: "The lever of last resort is to go out and acquire more spectrum," says PwC's Hays. "That's a costly proposition, as well as one with a limited supply." There's vacant spectrum out there in the wild. The problem is that some of it is held by companies and government agencies that can't or won't make good use of it, and a whole lot of it is unsuitable for wireless broadband. That's why the industry cheered last week when the Federal Communications Commission gained congressional approval to auction off a large chunk of some of the highest-quality spectrum around. The FCC is expected to raise $15 billion by holding incentive auctions for TV broadcasters, which could voluntarily choose to give up their spectrum and either go dark or share a channel with another local broadcaster. The auctions won't happen until 2014 at the very earliest. Bidding will be fierce: The FCC's last major auction, in 2008, raised almost $20 billion and drew bids from all of the industry's power players. But even for those with billions to spend, spectrum is growing prohibitively expensive -- and there's never enough. That means that unless carriers find new ways to stave off the crunch, smartphone customers will soon be seeing bigger bills for slower, spottier service.